Get quality from the first step. Everyone who walks into your facility will see a reminder of your high standards. 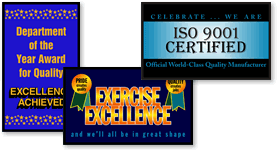 • Emphasize your quality assurance program with a mat. • Showcase American industry with patriotic images.